It is a chain of retail stores that is situated in California. The store is known for offering products at a price of 99 cents or less. Most of the company stores are based in Southern California and others are based in Arizona, Texas and Nevada. 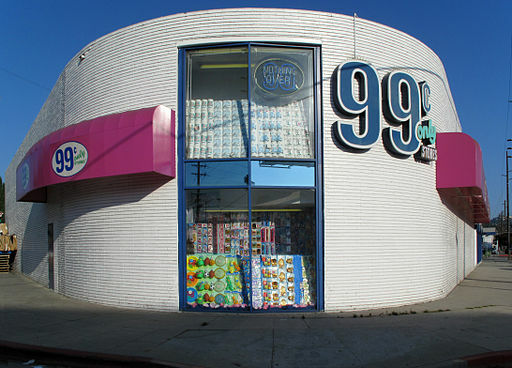 The 99 Cents Only Stores were founded in the year 1982 by David Gold. The idea initially came about as a way of liquidating wines that were slow selling at the store. Gold said that the wine or cheese never sold out at a price of 1.02 or 90 cents. He realized that products that were sold at 99 cents went fast. This is when he thought that 99 cents was the magic number to selling products. A full store of such bargains was created after prompting from a colleague. Gold also put televisions for sale at a price of 99 cents for the sole purpose of gaining publicity. The practice of selling brand new items at 99 cents for continues up to date. Another key feature concerning the company is that it has an operational IT system. The computer system not only orders stockers in distribution centers, but it also helps in registering sales and tracking the stores’ purchases. Based on the advertisements, 99 Cents Only Stores are operational for nine days a week. Holidays are marked by several commentaries and new products at 99 Cents.